Many companies fail to derive maximum benefit from a properly installed Balanced Scorecard. Some look upon it a fancy name for a Management or KPI report while others think that adding a couple of quality and customer service lines to the P & L will suffice. A truly “Balanced Scorecard” will define, articulate and track the link between the company vision & mission and the activities required to deliver success. The key however, is in the development of the strategic objectives that deliver these strategic results or outcomes. And while you’re at it, you have to make sure that your strategies and tactics are consistent. They have to work together and create a single thread, tying together in ways that make sense. Assess the mission and culture of your business. Include consideration of the organisation’s challenges, vision, and partners. Identify the components of the change management plan that will need to be communicated with the organisation and other key stakeholders. Focus on customer needs. Develop a strategy around how the company can best meet the needs and expectations of customers or clients. Determine what value the organisation brings to its customers. Define the organisation’s intent. Focus on the mission statement. Write specific objectives that correspond with strategy themes for what the organisation wants to accomplish. Map out the process. Use strategic mapping to determine how the organisation plans to complete the objectives defined within strategic themes. Include specific values that the company will bring to their customers and other stakeholders. Develop performance measures. Identify how performance will be evaluated, what standards must be met, and benchmarking data developed. All results must be measured and expectations must be communicated. It is essential that we agree the “key performance indicators” not “performance indicators”. Implement the process. Use a standardised system to input and track the objectives and initiatives, and communicate results. Custom software can be used, or a simple spreadsheet. However, the effectiveness of the reviews are critical to success. Cascade the scorecard. 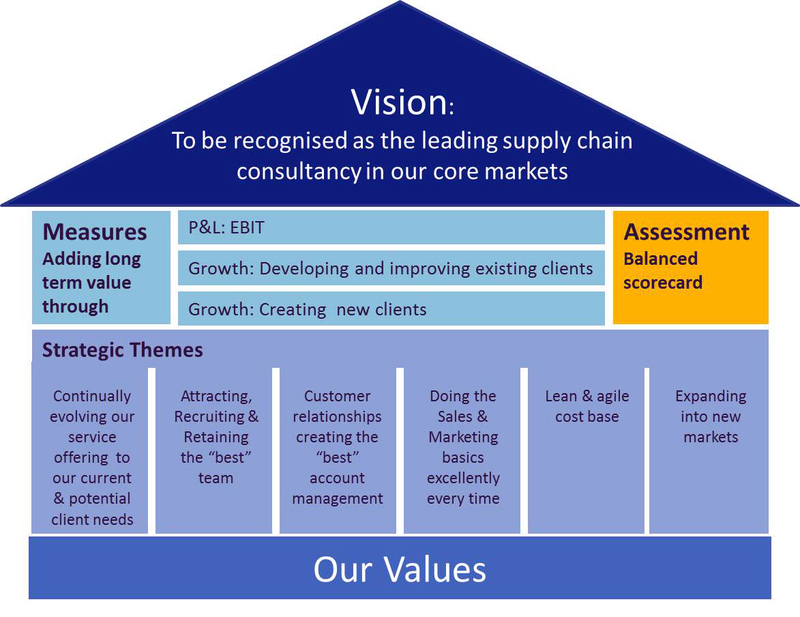 The balanced scorecard used at a macro, organisational level should be replicated for specific business units by functions and smaller groups tasked with meeting each objective. Keep the measurement tools and evaluation procedures consistent for every objective. Evaluate the scorecard and the process. Review the balanced scorecard. Evaluate whether the objectives are being met, and if the review process to meet the objectives is working.